The McGill Library holds an extensive collection of geospatial information resources, including over 200,000 print maps, historical air photos, orthophotos, satellite imagery, and spatial data sets. Coverage is worldwide with emphasis on the greater Montreal region, Quebec, and Canada. Maps and data vary in scale, date, and theme. Major sets include: cartographic plans, cadastral data, air photos, satellite imagery, and transportation networks. This guide is organized by the level of geography of each map and data series. You will find a list of geospatial resources available in print and digital formats, as well as index maps and links (where available) to request/download material from the library's map and geospatial data collection. Request Data using the geospatial data request form. Some data may also be downloaded directly from our server. Request an appointment to consult the print map collection located on the second floor of the Humanities and Social Sciences Library. As part of the geospatial data services the Library offers, we also keep track of the many Open data websites and portals. 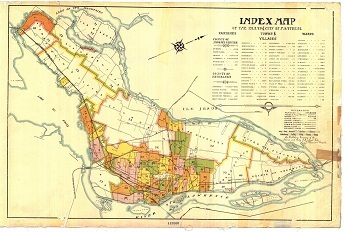 Contact us for assistance locating maps and data that we do not have in our collection.